The gold-medal winning USA National Team at the World Games. Photo: USA Ultimate. WROCLAW — The United States won gold yesterday at the World Games, overpowering a Colombian team that beat them earlier in the tournament thanks to much improved defense. After a back-and-forth first half, the US began the second half on a 4-0 run and took the game 13-7. After being outmatched in the first matchup, the American women were superb in this game, both delivering some tremendous offensive plays and stifling defense. Georgia Bosscher had two goals and three assists; Lien Hoffmann was the defensive MVP and added an assist and two goals. In contrast, Colombia’s Yina Cartagena, who had been dominant in the teams’ first meeting, recorded neither a goal nor an assist. The USA got off to a great start on offense. Anna Nazarov broke the mark to hit Carolyn Finney, who fired deep to Sandy Jorgensen. She leapt over a clumsy bid from Elisabeth Mosquera for the quick hold. USA then quickly broke after Alejandra Torres threw into a poach. George Stubbs tossed it in to Claire Desmond, diving on her knees, to go up 2-0. Colombia answered back and suggested that we might be treated to another barnburner. A patient possession saw Ivan Alba throw a lovely around continuation throw to Valeria Cardenas. Beau Kittredge was really struggling to keep up with Alexander Ford, maybe slightly nervous of the slippery turf and the possibility of jarring his knee. Bosscher spied Grant Lindsley going deep, but V. Cardenas made an excellent, backpedalling block. A few passes later, Mauricio Martinez fired deep, Sarah Griffith missed the bid, and Mosquera walked over the line for the break, 2-2. Jorgensen turfed a crossfield forehand in the redzone on the next point. Like nearly every point in this game, the defense was quick to put points on the board after the turnover. Esteban Ceballos saw Martinez open deep and hit him a beautiful crossfield throw. Patiently, Martinez waited for the easy dish to break again and give Colombia their first lead at 3-2. Strategic adjustments since the first game were apparent. After the USA got a hold, the USA men were really trying to poach onto Colombian women — the focal point of the offense — cutting deep. A miscommunication gave the disc to USA, and Dylan Freechild snuck the disc to Kittredge over a bidding Ford for the break and the USA went back in front, 4-3. As the USA defense started really clamping down, Colombia was facing a lot of reset difficulties. Hoffmann finished off a wayward throw before Griffith made a spectacular layout catch just outside the endzone; Hoffman tossed it in to Bosscher for another break, 5-3. USA messed up their switches on the following point, leaving Alba wide open; Julio Duque didn’t hesitate to put it up for the easy Colombia hold, 5-4. USA was careful throughout the game of not taking the bait from Colombia’s defense trying to get them to put up hucks into coverage, and they looked off multiple deep cuts from Stuart & Kittredge. Stuart eventually saw Bosscher isolated and sent a backhand to the endzone. Bosscher delivered another highlight reel catch to hold, 6-4. The teams traded easy scores into half. Colombia was more effective when funneling the USA into the middle of the field; most of the USA’s goals in the first half were down the sideline, where they were safe from poaches. USA’s poaching has largely been ineffective. What was effective were their tremendous pulls, flat marks, and intense pressure on the reset. Colombia started to come undone at the seams in the second half. Torres popped up a reset pass on the first point out of half and Stuart came down with it. They hit the sideline and then Bosscher launched a backhand up the line to Kocher, who joined in on the layout party for a break. USA continued to ramp up the pressure on a Colombia team that just didn’t seem confident throwing deep to their women. In the end, a rare Santiago Montaño mistake gave Grant Lindsley an easy block and USA broke again, 9-5. The floodgates were opening up, and the defense proved to be too much for Colombia to handle. USA landed two more blows and extended the lead to six at 11-5. They were looking as ruthless as they were in their comeback against Colombia on Friday. USA was crisp in their execution and finally looking comfortable in their roles. Kittredge was making long deep cuts. Jorgensen was a matchup problem in the deep space. Colombia had no answers. Colombia finally got their defense back on the field as Duque threw into the endzone for Montaño; Stubbs at full extension got a fingertip to the disc but it sat beautifully for the goal. A Mosquera handblock on Jorgensen was called back for a foul twice in a row, stalling the normally flowing USA offense. Mickle flipped a great around backhand break to hit Lindsley right in the corner for the 12-6 lead and game point, the game surely beyond Colombia. After absorbing a lot of pressure, Cartagena fired deep to Ramirez, who then dished to Duque for the offensive hold. When Bosscher uncorked a huge, hanging backhand to Jorgensen, closely guarded by Mosquera, it looked as though Colombia would finally get a chance to break in the second half. It was not to be. Mosquera jumped too early while Jorgensen timed her jump to perfection, catching the disc to win gold for the fourth consecutive time at the World Games. While Colombia would surely have wished for a better performance in the final, they will head home with a well-earned silver medal, their first medal at a World Games event. It’s a signal of just how strong their player development has been over the last decade, and with players like Manuela and Valeria Cardenas not yet 18 years old, the future is bright. 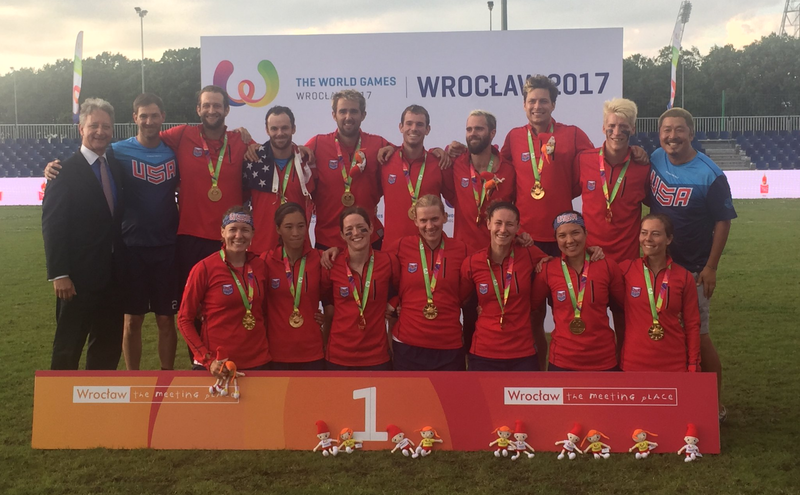 Comments on "Defense Carries USA Over Colombia To Gold At The World Games"